Sash clamps are used to clamp work together when it is glued. They vary in size and are normally used in pairs. The lengths are normally from 460mm to 1370mm. The bar is made from cold drawn mild steel and the head and slides made from malleable iron. When in use, the sash clamp is placed below the work to be glued / assembled. The slides are arranged on either side and scrap wood is placed between each face and the work. This protects the work when the thread is tightened. The tommy bar is used to tighten the thread and pressure is increased slowly. After clamping a frame, the 'squareness' of the frame should be tested and adjustments made to the position of the clamps if necessary. The internal angles of the corners should be 90 degrees. The 90 degree angle is checked with a try square or a rule. A long ruler is used to check large frames and a try square is used on smaller ones. When using a ruler the diagonal distances are measured. If both measurements are the same, the angles at each corner are correct. If the two measurements differ, the clamps need adjusting until the measurements are the same. A try square is pushed into the each corner of a smaller frame / box, to check that the 90 degrees internal angle is correct. 1. Draw a typical sash clamp and label the important parts. 2. 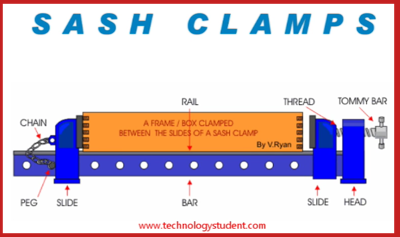 Using diagrams and notes, explain how a pair of sash clamps are used to ‘clamp together’ a frame / box. 3. Describe how the internal angles of a frame are checked, after sash clamps have been tightened in position. 4. What could happen if the internal angles are not checked and the frame is glued together?